IT is not, perhaps, generally known - on this side of the Atlantic at any rate - that the Republic of Mexico has, for a considerable number of years, devoted much attention to aviation, principally on the military side. ДальшеMore>>> They have possessed an air service which has been developed year by year into one which, as far as our knowledge goes, is now a fairly efficient, although small, air arm. At first they relied on foreign machines, consisting mainly of Avros, Morane-Saulnier parasols, Salmson biplanes, F-type Farman bi-motored biplanes, etc. For various reasons difficulty was experienced in obtaining aircraft and engines from foreign sources, so it was decided that these should be produced in Mexico itself. Late in November, 1915, therefore, a National Aircraft Factory was established at Valbuena, Mexico City, equipped with up-to-date machinery, etc. Here several monoplanes of the Bleriot and Morane-Saulnier type were constructed, as well as a training biplane fitted with a Mexican-built "Aztatl" engine, of the Anzani type, developing 80 h.p. A curious single-engined pusher twin-fuselage biplane was also produced at the factory, and about the year 1918 a neat tractor-fuselage scouting biplane, the "Microplano," was built, which gave, we believe, satisfactory results. It was fitted with a 160 h.p. Hispano-Suiza engine, which engine, it may be mentioned, was built under licence at a specially-equipped branch of the factory at Valbuena. The "Micropiano'' possessed several interesting features, and was a single-bay biplane, with the top plane very slightly larger in span than the lower one. A somewhat unusual arrangement was adopted for the interplane struts, which in addition to sloping outwards were staggered as regards their fore-and-aft location, i.e., the rear struts were further out from the fuselage, so that the distance from the wing tips, which had a considerable rake, was the same for both rear and front struts. Lateral balance was by wing warping, and there were no fixed tail surfaces - rudder and elevators being of the balanced Morane-Saulnier type. The girder fuselage was very deep forward, but tapered sharply towards the rear to a point. The "Microplano" - which was some 26 ft. in span - had a speed of about 125 m.p.h., and weighed, all up, 1,400 lbs., the useful load being 400 lbs. The tractor air-screw was also of Mexican manufacture. Just recently the National Aircraft Factory produced three interesting machines, which we illustrate by the accompanying drawings of the plan, side, and front elevations of each type. We also reproduce a photograph of one of these machines, which differs slightly from the model shown in the drawing. All three machines are monoplanes of the "semi-cantilever" type, having thick wing-sections of the Jowkowsky breed. Sr. A. de Lascurain y Osio, Director-General of the Factory, is responsible for the design, and during their test nights, piloted by Joe Ben Lievre, they gave every satisfaction, both as regards the construction and the performance. The first of these machines, the "3-E-130," is a single-seater scout, with the straight main planes mounted above, but very close to, the fuselage, and braced to the latter by struts extending to a point about one-third the total span from the wing tip. The model illustrated by the photograph has a single I-strut each side of the fuselage bracing the wings, whilst the drawings show a pair of struts each side – the arrangement of which does not appear to us to be all that is desired aerodynamically. Chord 5 ft. 3 ins. O.A. length 21 ft. 9 ins. Height 7 ft. 4 ins. Range 1 hr. 30 mins. The second machine, the 5-E-132, or "Mexico," is a two-seater school 'bus, also of the parasol monoplane type, fitted with a Le Rhone engine of 80 h.p. The main feature of this machine consists of the unusual plan form of the wings. These have the leading edge swept back from a point about one-third the span from the tips, the centre section being straight. The trailing edge, however, is swept back at the centre section, and is then straight as far as the ailerons. The wings are braced from the fuselage by a pair of struts as in the previous model. Chord 7 ft. 6 ins. Overall length 22 ft. 4 ins. Height 8 ft. 6 ins. Area 279 3/4 sq. ft.
Span 50 ft. 5 ins. Chord 19 ft. 7 ins. Height 9 ft. 9 ins. Weight (empty) 2,486 lbs. (B.M.W. ); 2,860 lbs. ("Liberty"). Weight, laden 3,850 lbs. (B.M.W. ); 4,620 lbs. ("Liberty"). Speed range 46-124 m.p.h. (B.M.W. ); 50-155 m.p.h. ("Liberty"). Ceiling 21,300 ft. (B.M.W. ); 24,600 ft. ("Liberty"). AVIATION IN MEXICO: Two views of the 3-E-130 scout. The above model differs slightly from that shown in the drawings. 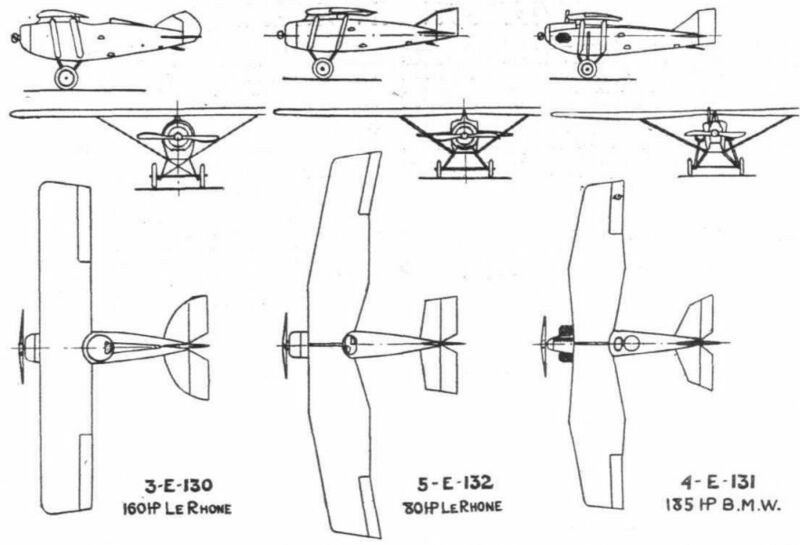 AVIATION IN MEXICO: General arrangement drawings of three military monoplanes recently produced at the Mexican National Aircraft Factory, Valbuena. The 3-E-130 is a single-seater scout; 5-E-132 is a two-seater school machine; 4-E-131 is a two-seater reconnaissance and bombing 'plane.